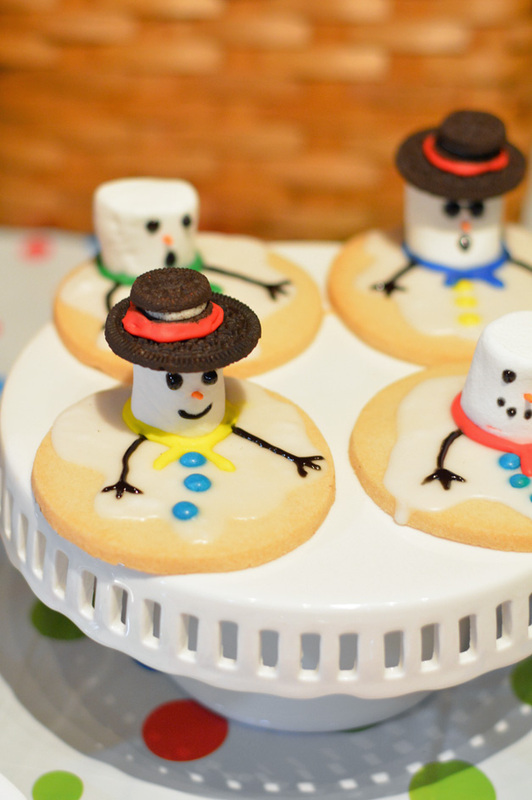 How cute are these melted snowman cookies? 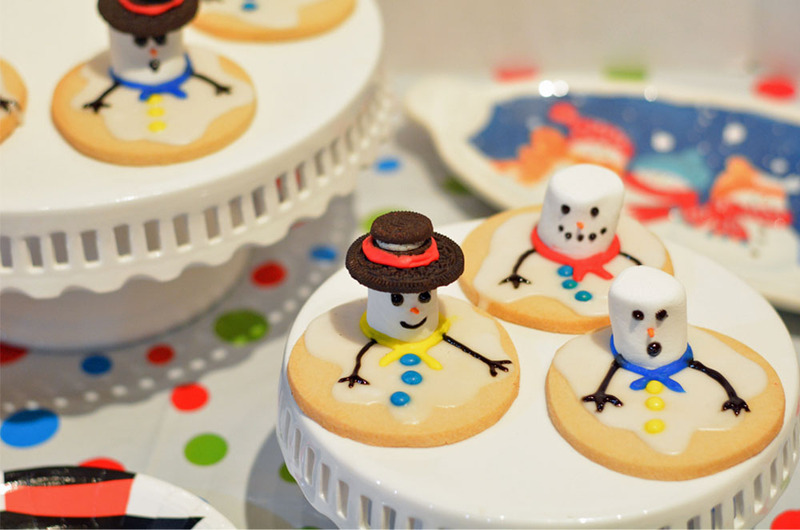 Gather the kids in the kitchen on your next snow day and have a fun afternoon sipping on hot cocoa and making these melting snowman cookies. With over a two feet of snow on the ground and more in the near future, the kids have been all about the snowman building, fort making, and hot cocoa. 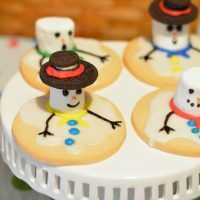 This past week while we were stuck inside with below zero temps, I began thinking of this upcoming summer and the snow melting and decided to have a little fun with the kids making these fun melting snowman cookies. 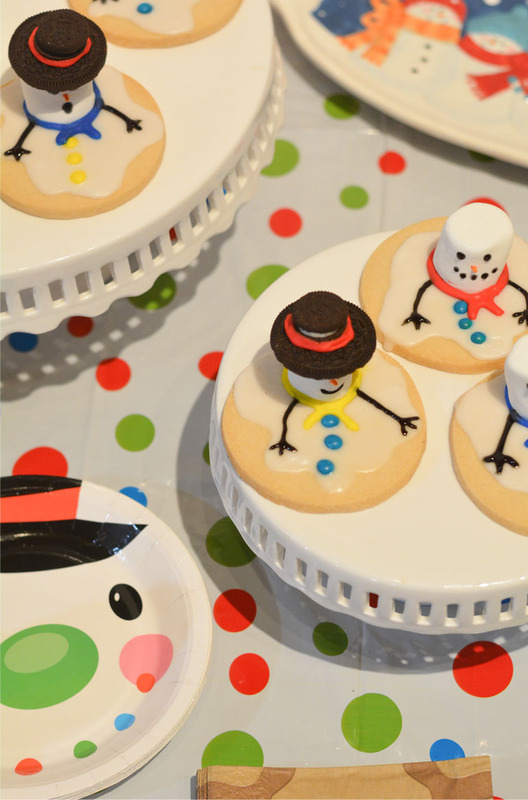 You can make the sugar cookies and the frosting from scratch, or to save time you can pick up prepacked dough at your local grocery store, or even pre-baked sugar cookies. The tub of frosting can also be found in the baking section. Cream butter & sugar together until light & fluffy. Add egg and vanilla, mix. In a separate bowl, mix together flour, salt, & baking powder. Slowly mix dry ingredients into the wet ingredients, continue mixing until combined. Cover and refrigerate dough at least 1 hour. When ready to use, roll dough onto lightly floured work area using a rolling pin until about 1/4 in thick. Use preferred cookie cutter shapes. Combine milk & sugar, mix until smooth. Use the frosting as is, or separate into bowls and add food coloring. For mess free decorating, place the frosting into a piping bag. 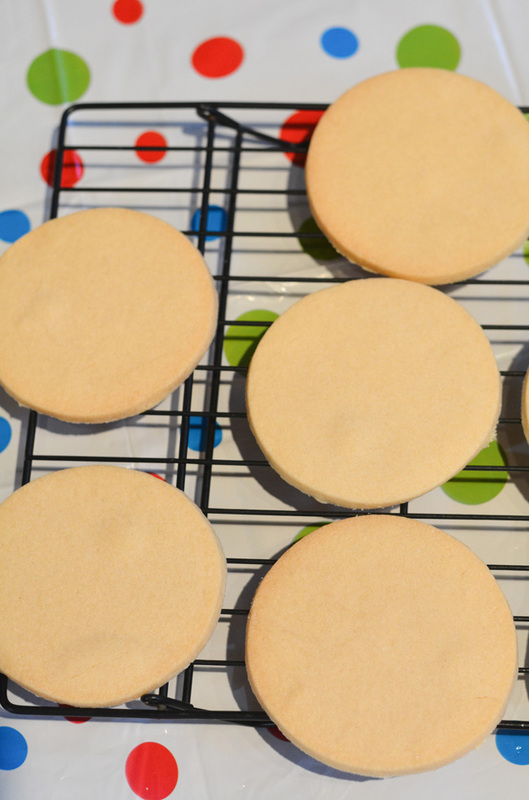 Bake sugar cookies and allow to cool. 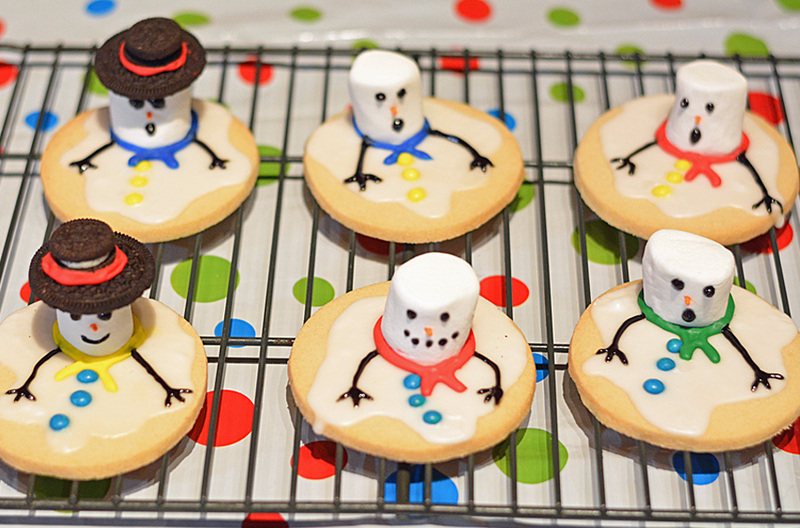 Depending on the size of your cookies, spoon about 1/2 – 1 tablespoon of frosting in the center of the cookie. 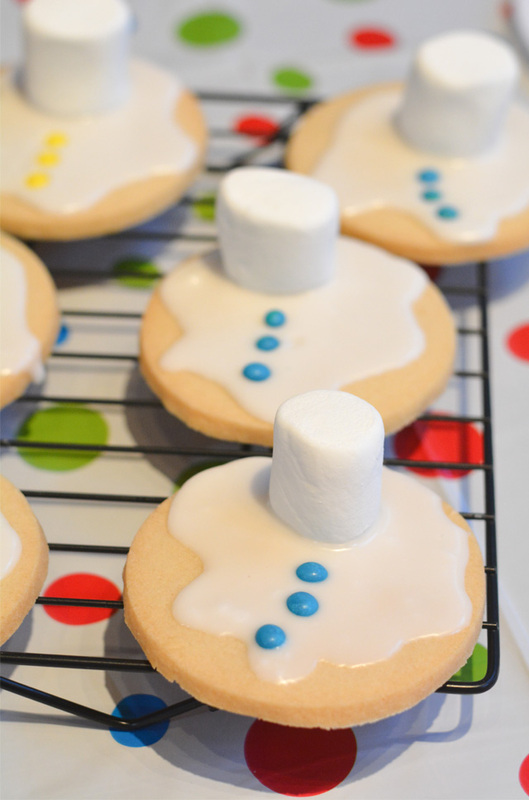 Spread the frosting around the cookie, top with a marshmallow and three mini M&Ms or small candies for the buttons. Using black icing, make the arms, eyes and mouth. Use an orange sprinkle to make the nose. Use the writing icing, make the scarf. Separate the big Oreo and scrape the filling off. 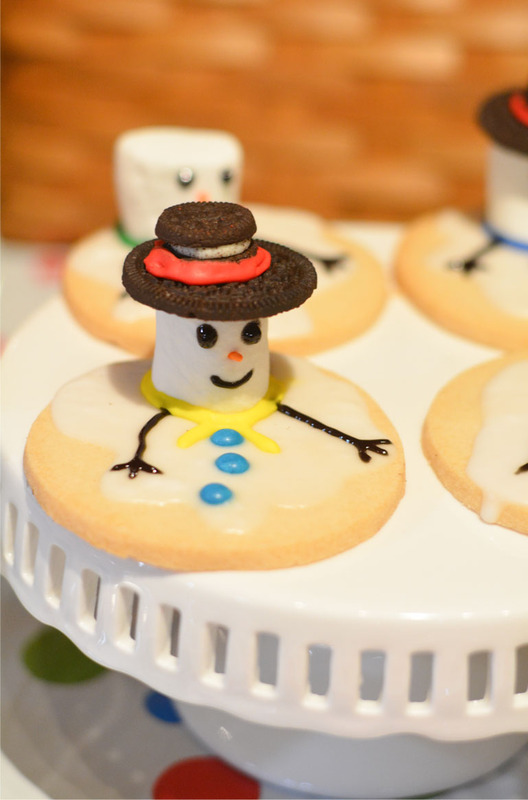 Add frosting on the bottom of the mini Oreo and place onto the larger Oreo to make a hat. Add frosting to the top of the marshmallow and top with the Oreo hat. 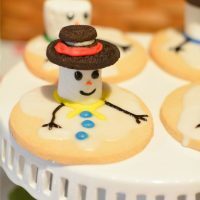 Allow the frosting to harden on the melting snowman sugar cookies before storing in an airtight container.